The most comprehensive suite of tools for downhole formation characterization. Geophysical borehole logging, also known as well logging or wireline logging, can provide accurate data of the physical properties of geologic units within the borehole environment. Borehole logging tools encompass a wide range of sensors to evaluate the in-situ formation in boreholes either cased or uncased. Tools range from mechanical devices, nuclear/gamma, acoustical, electrical, imaging, and sensors for fluid properties. In all cases the system consists of the borehole tool that is manipulated up and down the borehole from a winch up to several hundred feet or more. 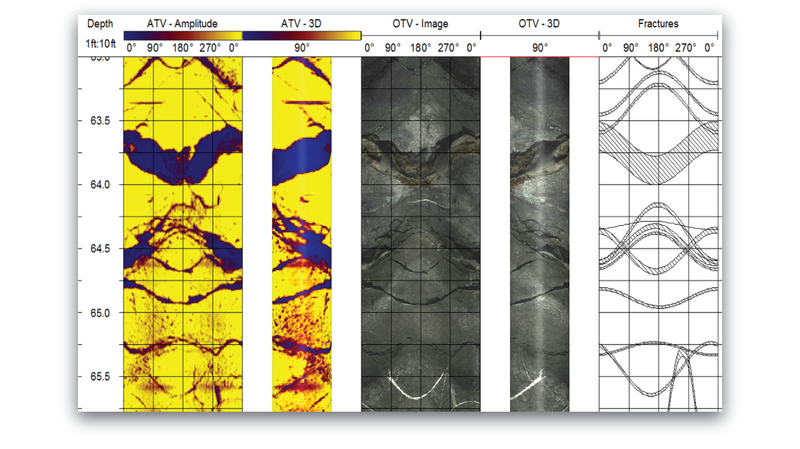 Common applications involve detailed mapping of fracture zones and their respective orientation, geologic characterization of rock types, fluid flow for groundwater evaluation of transmissive zones, contaminant or tracer detection, and rock properties. The borehole systems are highly portable and can be transported by logging vehicle, ATV, or flown into to remote sites if necessary. Industry standard-WellCADTM Software is used for data display and interpretation of sensor data. The software produces interpreted fracture orientation, log editing, analysis and presentation of all logging data.